Arachnoid Cysts are congenital lesions that arise during Brain and Skull development from a splitting of the Arachnoid membrane, one of the covering layers of the Brain. This splitting results in the formation of a cyst. Cerebrospinal Fluid (CSF), the fluid that bathes and protects the Brain, circulates within the Subarachnoid space. With the "splitting" of the Arachnoid membrane CSF appears to "flow" into the split region forming the cyst since the CSF cannot escape the region at the same rate that it enters the cyst. This process results in a slow increase in the size of the cyst over a time frame that varies from one patient to the next. As a consequence the Brain is slowly compressed. Most Arachnoid Cysts become symptomatic in childhood. The exact symptoms depend upon the location, size and rapidity of growth of the cyst. These cysts can become quite large and yet only cause mild symptoms. In many cases of "giant" Arachnoid cysts that are not identified until adulthood, the increase in size is sufficiently slow and the compression of adjacent Brain so gradual that symptoms do not develop until the Brain's capacity to accommodate to any further compression/distortion is exhausted. Unfortunately this is actually late in the course of the disease process. Almost all Arachnoid Cysts occur in relation to an Arachnoid Cistern (anatomically named spaces within the subarachnoid system). The most common locations are the Middle Cranial Fossa (near the Temporal Lobe) and Suprasellar (near the Third Ventricle). However, cysts may be found anywhere within the intracranial compartment, including the Posterior Cranial Fossa. Routine evaluation with CT or MRI scan is usually satisfactory. CT Scans usually show a smooth bordered cystic mass composed of a density similar to Cerebrospinal Fluid. There is no "enhancement" with contrast administration. Expansion of the nearby bone by remodeling is usually seen, confirming their chronic nature. MRI Scans demonstrate the CSF filled mass together with its "mass" (or pressure) effect upon the Brain. 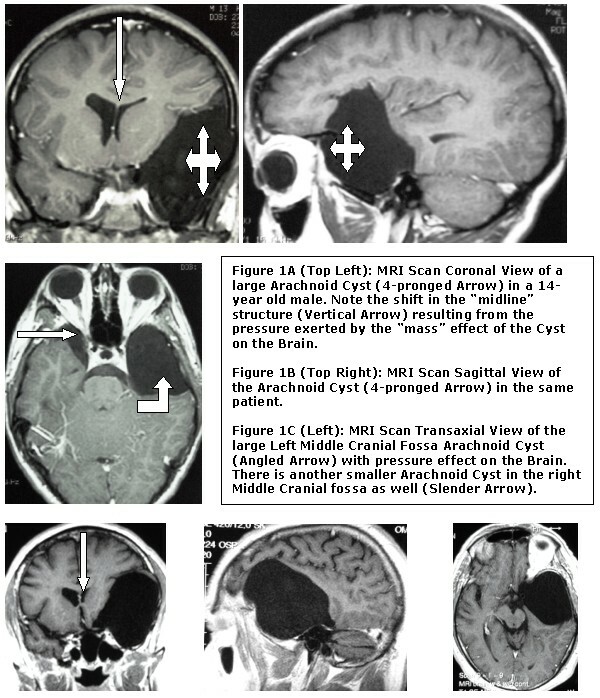 Figure 2: A series of MRI Scans of a large Left Middle Cranial Fossa Arachnoid Cyst in a 61 year old Male. This patient denied any previous symptoms of any variety and led a very active life including body contact sports. His symptoms developed ONLY at this age. 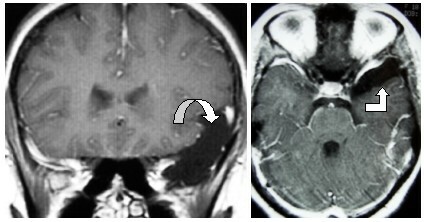 All views demonstrate the extent of Brain compression with the Left image showing the left to right shift of the midline structures of his Brain (Arrow). Figure 3A (Left): MRI Scan (Coronal View) of a Left Middle Cranial Fossa Arachnoid Cyst (curved Arrow) in an 18 year old female. Figure 3B (Right): MRI Scan (Transaxial View in the same patient). She has not required treatment and has remained asymptomatic without any increase in the size of the cyst for 3 years. This is a series of MRI Scans (Figures 4A-C) of a 54 year old Male who complained about recent hearing impairment and ringing ("Tinnitus") in his Right ear. The scans show a large Arachnoid Cyst in the Right Cerebellar Pontine Angle of the Posterior Cranial Fossa. 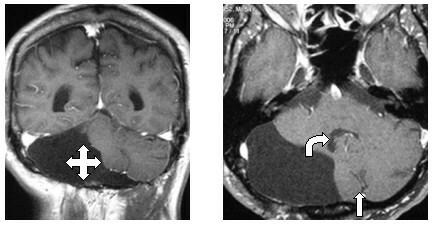 Figure 4B (Center): MRI Scan (Transaxial View) The large Arachnoid Cyst has displaced the Cerebellum as well as the Brainstem with "tilting of the 4th Ventricle (Angled Arrow). The posterior "Midline" structure is displaced to the Left as well (Slender Arrow). 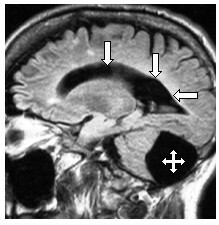 Figure 4C (Bottom Left): MRI Scan (Sagittal View): The Large Posterior Cranial Fossa Arachnoid Cyst (Quadrangular Arrow) has also interfered with the normal CSF pathways resulting in Hydrocephalus. Note the dilated Lateral Ventricle (Arrows). Arachnoid Cysts that do not cause significant mass effect or symptoms (Figures 3A & 3B), regardless of their size and location, generally do not require treatment. If there is significant or severe mass effect on surrounding structures, or if there are symptoms, then surgical treatment is recommended. Figure 5: Operative Photo. Minimally Invasive Microendoscopic resection of a large Left Middle Cranial Fossa Arachnoid Cyst in a 14 year old Male (same case as Figure1). 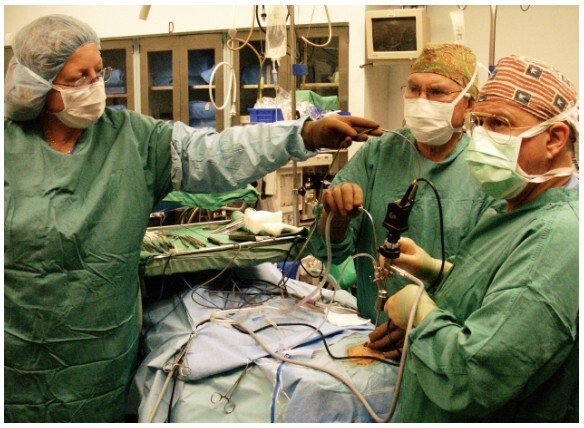 The Surgeon (Far Right) along with the Assistant Surgeon, Dr. James E. Bland, (Center) are watching an image transmitted to a video monitor from a small video camera mounted on the endoscope. The Surgeon (Dr. Lazar) is manipulating micro-instruments THROUGH the Endoscope. The Neurosurgical Nurse (Ms. Chris Thomson) is holding a "micro-bipolar coagulation" wire in order to eliminate any undue tension on the Endoscope. Endoscope provided by Karl Storz Endoscopy-America, Inc. 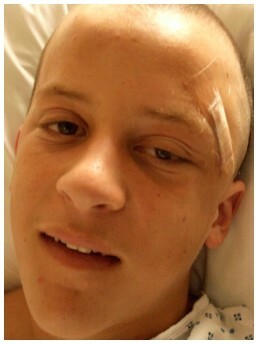 Figure 6: Early (30 minute) post-operative photo of the 14 year old Male patient with the large Arachnoid Cyst shown in Figure 1. A small bandage covers the short incision that was used to create a "burr-hole" opening in the side of the Skull. Arachnoid Cysts are an area of specific interest for the Neurosurgeons and staff of Neurosurgical Consultants. Their successful treatment in most cases involves the use, where applicable, of highly advanced Minimally Invasive Microendoscopic Techniques. This revolutionary concept in Neurosurgery greatly limits the amount of surgical exposure required and therefore, limits the amount of tissue that is touched and retracted during the operation. 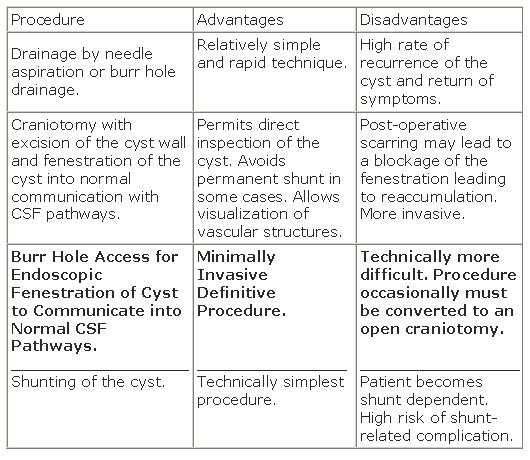 Most of these Endoscopic procedures are conducted through very small holes in the Skull. This results in less post-operative pain, earlier mobilization, diminished hospital stay, less risk for complications, an earlier return to activities as well as lower overall costs. Videos of these procedures are available on this website.